Current economic times are forcing companies to search for new ways to cut costs—all while maintaining efficient and flexible IT infrastructures. 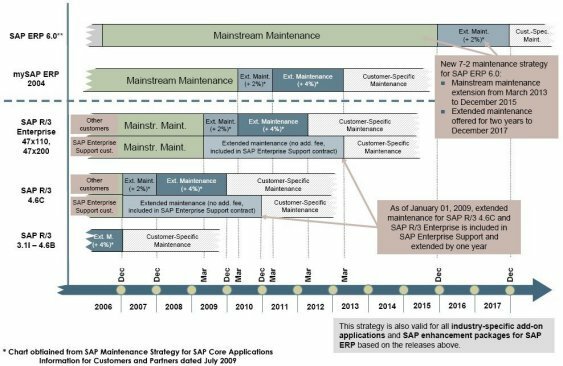 This is compounded by the end of mainstream maintenance for many SAP releases, compelling customers to upgrade (see overview). Historically, this has been a major undertaking. Not only is the upgrade project intensive on resources, it is also a source of risk. Any errors during the upgrade process could severely disrupt the company’s operations. When you face this much risk, depend on Texperts’ 30 years of SAP experience. In addition to years of experience in upgrade services, Texperts offers service tools that help mitigate risk. These tools, vUpgrade and vBreakFix-Path, allow the upgrade to be developed independent of the SAP Landscape. Adjustments and corrections can be isolated and identified before Go-Live. With SAP's Mainstream Maintenance coming to an end for many of SAP's legacy products (SAP R/3 3.1I-4.6B, 4.6C, 4.7, etc. ), many companies are finding themselves in the difficult position of having to upgrade their SAP Landscapes. SAP Upgrades can be very complex and costly for companies and in some cases can take years to complete.